Maputo, Mozambique is like my second home. A story for another day. When I told my mother that I will spend some time in Mozambique from 2009, she did not like the idea. She never even thought of malaria, which was my initial concern. She mentioned floods. That was the least of my worries. I thought of my daughter and malaria. When you are in Pretoria, you never really get the malaria exposure and you hear all the horror stories. The travel clinic made Maputo sound like a war zone, where the chances of survival are 50/50. After my investment in research and doctor interviews, I was just set to have a second temporary home in Maputo. We went for it as a family. I now enjoy the best of both worlds. Mozambique is quite exotic and beautiful in its natural way. However, not everyone can see past its flaws. Well, I am good at judging things by their potential. Later on, I will share some images of Mozambique, the beaches and other tourist destinations. It’s such a beautiful country. Very poor, but rich in natural tourism resources. Maputo, Mozambique’s capital city has a cluttered feel. Lots of people, small roads and overcrowded beach. I think this place was meant for a lower population of Portuguese people. But the vibe is just great and totally different to South Africa’s. Overall, its a great place to be. Last week, January 20s, 2010, my mom’s nightmare came to pass. There were heavy rains and flooded roads. 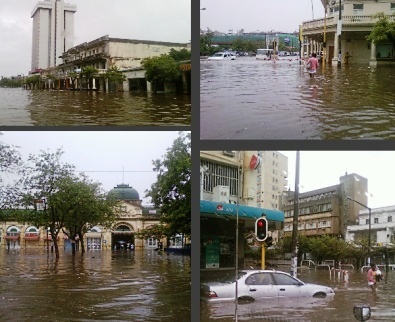 I was in Pretoria when it started and my family was in Maputo, worried about my Honda Civic’s ability to swim. This car is just not the best for Mozambique’s roads, rain or sunshine. Check the photos above to see the water levels in the city roads. Join in and write your own page! It's easy to do. How? Simply click here to return to Ask Mbini.